Looper is the best time travel film made in recent times, I really missed them. The acting is brilliant and the story is fascinating, but still it was a bit slow and I can’t believe I am going to say this but I did feel bored at times. The visuals and dialogue are probably the weakest link in this film, with only a tiny amount of lines that were any good or memorable and visuals that were a little weak as well not that there were many visuals. So it’s a fun film which is interesting to think about, plus the acting is great. 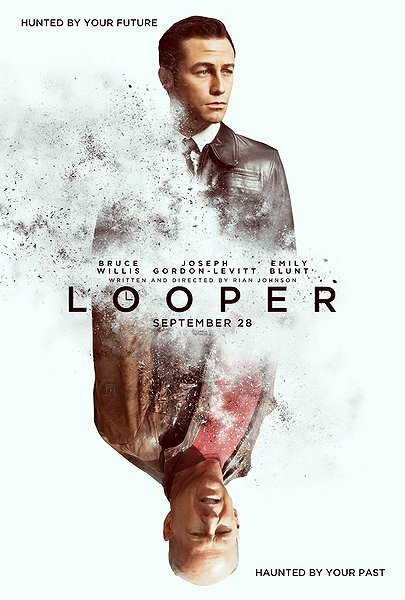 In the futuristic action thriller Looper, time travel will be invented – but it will be illegal and only available on the black market. When the mob wants to get rid of someone, they will send their target 30 years into the past, where a “looper” – a hired gun, like Joe (Joseph Gordon-Levitt) – is waiting to mop up. Joe is getting rich and life is good… until the day the mob decides to “close the loop,” sending back Joe’s future self (Bruce Willis) for assassination. Just as always I will not be giving away any spoilers so you don’t have to worry about reading this review before seeing the film. To start off let’s talk about the acting. The acting was perfect and I have absolutely nothing but praise. Joseph Gordon-Levitt playing a young Bruce Willis was shockingly good, clearly put a lot of work into learning each other mannerisms and general behaviour before filming. I also liked the relationship that develops between Young Joe and Sara which wasn’t conventional but I really loved watching it play out. The dialogue wasn’t the best in this film, what I mean by this is that there are only a few scenes which demonstrate memorable lines or character dialogue, the best ones are all in trailers or clips that had already been released. However the story of this film isn’t given away too much in trailers so you don’t have to worry about. There’s not a great deal of other characters to speak of as the story strongly revolves around three main characters. Oh and there is one of those scene’s that will prompt many ‘Still a better love story than twilight’ Meme’s. So let’s talk about something more fun like the visuals. The special effects, physical props and visual landscape shots where good but I think could have been better, however I have checked and the budget for this film was actually pretty small at $30M so I can let them off for some of the flaws I found and to be honest they were pretty small anyway. The way people get transported is really simple because of budget reasons I think but at least they didn’t try something fancy which failed miserably but I think it worked well in this film. I did like the visuals used in some of the Telekinesis scenes but even they can be a bit weak, some were obviously on strings. There wasn’t a great deal of music or sound that stood out to me, but at least they didn’t use lots of Skrillex like in some of the more out there trailers and clips online. The best reviews I found would be these “This is an exciting, exceptionally well-made futuristic thriller that also happens to be loaded with lived-in touches and punchy ideas.” Rene Rodriguez. Some of the ideas in this are very clever and a little harsh at times which might shock a lot of people. “Featuring fantastic performances from the entire cast, absorbing cinematography, and one of the most unique concepts for a film in quite some time, Looper is one of the most creative, intelligent, and unpredictable films of the year. “Chris Sawin. This is easily the most unique and original film released this year which can really make you think. “Best stay focused and avoid a loo break!” Pauline McLeod. Seriously don’t go to the loo you will get so lost (Use a cup or something). My favourite scene without giving anything away would be the last 20 minutes because it all closes to an end with some really smart stuff, were as the rest of the film is a bit slow. Nice review Tim. I tried thinking back on the dialogue to debate with ya, but couldn’t remember too much (short of a few lines between the 2 Joes in the diner) but I’m OK with that only because the strength for me was the story and visuals. I see your point though for sure. If you can’t remember any good lines from a film, that gets a bad Dialogue score! I mean come on its a time travel film, oh so many providential lines that could be used. Worst though was that the lines that were memorable had already been heard in trailers, thats another bad score for the dialogue!!!! I think I liked this a little more than you. I had a few small issues with the first half, namely young Joe’s pointless relationship with a prostitute and the believability of Paul Dano as a looper. I mean what crime organization would hire that guy??? But as a whole I had a lot of fun with it. Really need to see this one. It sounds pretty interesting. Good review. For me, the film was great in the first-half. Involving, fast-paced, and an fascinating concept. By the second half, the whole sub-plots of telekenetics and the evil boy-man made the film very muddled and wasted it’s potential. 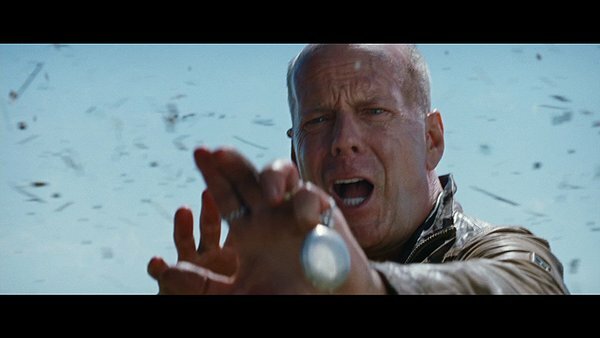 Surely Rian Johnson could have had a better reason for Bruce Willis to kill his younger self other than the typical, “They killed me wife!” sob story. The movie would have been better if it focused on Young Joe vs. Old Joe, than other characters and storylines involved. It did feel like there were at least 3 different stories at play and it did feel a little messed. There was the Loopers, then the Telekinetic Kid, then there was there was old Joe’s future life and wife. So yeah they should have stuck to one story line and concentrated on that rather than jump from one story to another without enough development. not quite rdy yet, but will be up shortly. Almost went to see this in the theater this weekend but I am keeping my movie theater outing (I probably wouldn’t go two weeks in a row) for Taken 2…!